Sailing’s oldest enemy played havoc what was supposed to be the busiest day of the Hempel Sailing World Championships Aarhus 2018 so far on Monday. In the men’s 470, Australia’s Mat Belcher and William Ryan, the silver medallists in Rio, gold medallist in London 2012, won the only race of the day in the gold medal fleet. They are now just one point behind the Swedish 2018 European Champions, Anton Dahlberg and Frederik Bergström, whose 13th place became their current discard. The women’s 470 gold and silver fleets tried to start long into the afternoon to no avail. The Finn gold and silver medal fleets had been postponed earlier in the day. In the Nacra 17, only the yellow qualification fleet was able to get two races in and even the hot favourites, Italy’s Ruggero Tita and Caterina Marianna Banti, struggled. In the first race they were 23rd at the top mark before storming back to 4th. But they could not repeat the trick in the second race, finishing 16th – their current discard. Nacras need 10-15 knots to foil upwind and about 7 to start downwind. But one Argentinian crew will not have been complaining about boats being stalled on the finish line. It was not the Rio 2016 Olympic champions, Santiago Lange and Cecilia Carranze Saroli, but their junior compatriots Mateo Majdalani and Eugenia Bosco, who followed a win with a second place. In the second race, they were one of three boats to benefit in the slowest motion of a finish as the Finnish boat went backward from leader to fourth crossing the line at just over a knot. 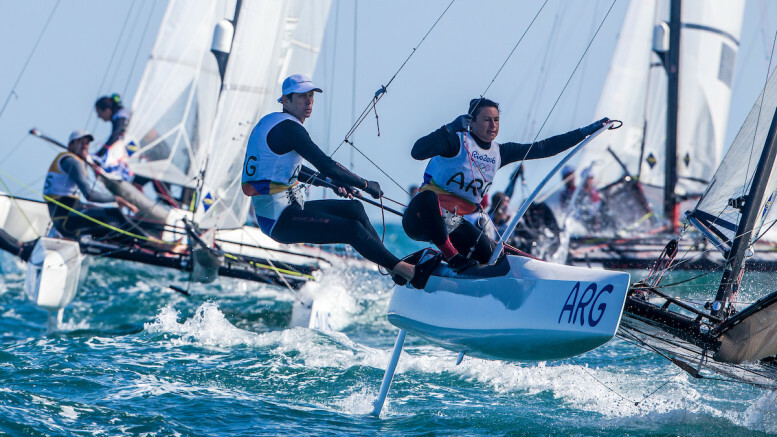 In the 49er, the young French pair of Lucas Rual and Emile Amoros continued to enjoy themselves with a fifth and a ninth place keeping them top – albeit in an incomplete day of racing. That last ninth place will not count, however, because the other two 49er fleets were unable to run their seventh races. The fleet will now be split into gold, silver and bronze fleets on the basis of their first six races – the minimum required for qualification – and race again on Wednesday. France’s Nicolas Parlier won the only race in the men’s Kiteboard – to make it seven out of seven so far. In the women’s RS:X, Great Britain’s Bryony Shaw won the only race possible and Poland’s Zofia Noceti-Klepacka was third, taking her top of the leaderboard.